We included an item about the Valiha High project in our very first News page back in 1996, but since the work has proved so successful, we thought that a more complete overview might be appropriate as the project reaches the end of its second year. Whilst working in Madagascar recording our 'Son Egal' album, I was saddened and appalled by the way a lot of Malagasy youth now spend their time when they are not in school or working. Every little street corner has private video viewings which show mostly pornographic or violent crime videos which are too popular amongst youngsters. This incidentally has resulted in completely ruining the cinema business in town and so there is not a single cinema open in Antananarivo any more. There is no way I can undo the violence which is thriving in Madagascar, partly as a result of this, but an idea sprang into my mind while I was watching yet another trailer for a violent film on the TV. 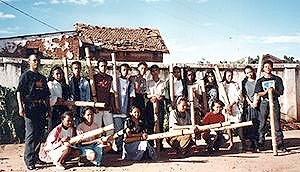 Now I am trying to help make it possible for children aged from 8 to 15 to be taught the most famous traditional musical instrument of Madagascar, the Valiha, a bamboo zither with historical roots right back to Indonesia. Not only does this teach them a useful skill and give an enjoyable leisure activity, it also revives a pride in Malagasy culture to help combat the many unsuitable imported influences. Lessons are free of charge, and the aim is that pupils are to be given a valiha each to practice at home and create their own music. There should eventually be competitions and prizes to be given. The example of Tarika as a famous group touring around the world will hopefully encourge further concentration since a lot of school leavers and artists do not even know what are they going to do next. We welcome donations to help us buy valiha, employ young valiha teachers, prepare publicity, leaflets, prizes and make things go smoothly. Every £1, $1, 1FF or 1000fmg makes a difference! Four villages have been visited in the outskirts of the capital Antananarivo - Fenomanana, Mahazoarivo, Morarano and Ambohimiandra. In Morarano we discovered that the village even had its own valiha teacher! , so the children did not need to wait to be taught while members of Tarika were away on tour. Rakotozafy Jules is a very fine valiha/marovany player from the Betsileo tribe. He is about 42 years old and was delighted that his skill would be of some use and that he could get paid for it too! At the moment we can only afford to pay one teacher per village and run the scheme in one village at a time. I hope to be able to change this situation soon but more fund raising activities must take place. One teacher can only handle a maximum of 15 children. Sometimes, 2 or 3 drop out and do not attend until the end but they still get to keep a valiha. Apart from bad timing of Valiha High publicity last November during the presidential election campaign when our posters were covered up by publicity for politicians, nothing has ever affected the numbers of children attending. In fact, we have had to limit them because of our budget! During our first year, there were about 60 children taught (an average of 15 children per village) and their age varied from 8 to 26. Our original intention was to limit the scheme to those between 8 and I5 but it was impossible to refuse those between 15 and 30 who wanted to attend the lessons since they were all so keen, which was of course good news. It actually took a lot of persuading of the parents of the younger ones to let their children follow the scheme - a lot of hard work for the organiser. Because of this, we have decided that the age group will in future be between 9 and 25 years old. There might still be some exceptions: for example, one old woman wanted to follow the scheme so that she could teach her own children at home at their own pace. By the way, it is also interesting to note that there are more girls than boys interested in playing the instruments, quite a change from traditional practice. Children had 2 hour lessons every Saturday afternoon for 6 weeks to introduce them to the instrument, teach them basic playing skills and show them how to create a song to perform at the end of the session. They were given one valiha each to take home on which to practice and these instruments belong to them when the term is over. So far, we have been blessed by the spirit of the ancestors, for all the halls which we have been allowed to use to teach this sacred instrument came free of charge! So far they have all been local church (Protestant and Catholic) halls. Huge thanks must go to those who were so kind as to permit their use. Mr Randrianarivo, the best valiha maker in Madagascar who is now very old, is still the provider of our valiha. Unfortunately, this is one area in which we encountered an unexpected problem. The valiha has now gained in fame abroad, and one particular company has gained a monopoly over the supply of materials, buying bamboo in bulk. 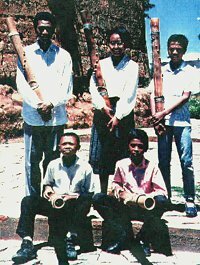 As sole supplier, they are then able to buy finished instruments at a low price from Mr. Randrianarivo, but only sell them at the high prices that foreigners can afford. This has created problems for locals - including us - to find good valiha at economic prices. Even if the children want to buy a valiha in a different key to the one we donated, they cannot afford it. But perhaps because of Valiha High, a new generation of valiha makers will eventually surface. In February 1997, we held a party at the church hall of Ambohimiandra to give out certificates of achievement to all students who attended the course, and prizes for the three best valiha players. Each village class played 2 tunes together to demonstrate their work and then each student played a piece on their own. Rakotoarivony Mamy, young man of 20 was the overall winner. It was unbelievable that he had only learnt the instrument for six weeks. His finger plucking speed already matches that of any professional player! Andrianaivo Heritina came second, another young man of 24. His ambition was to turn church music accompaniments into a valiha orchestra. Rajoelinarivo Hajamanana, a young lady of 17 came third. She is very bright and creative. Judging by what we spent in the first year, it looks like I will have to raise at least £500 every year to keep the scheme running. When you think about it, that really is an exceptionally small budget for a scheme that achieves so much. Please feel free to donate, and spread the word to anybody else who you think might be interested in helping us. You must have been wondering what has been happening with the Valiha High scheme in Madagascar as it is more than a year since my last report. In fact, things have been so successful that it kept everybody involved quite busy. As before even the smallest contribution has gone a long way. Please feel free to donate again! Since my last letter, we raised a further £2048 to continue the scheme and have expanded in the 1997/1998 year to teach more than 80 new children in 4 new villages of Morarano (3 times), Mandriseza, Androndra (twice) and Ambatoroka. Andrianiaina Rasandimanana continued to be our local organiser, and Rakotozafy Jules is now our dedicated and permanent teacher. We can still only afford to run the scheme in one village at a time, but have also been able to give follow-up lessons to earlier pupils from the first villages in which we ran the scheme. Some of the better students have now formed their own groups, one of five girls and another of five boys, who we really look forward to seeing perform in the future. We have had a number of really good end-of-term party/concerts in which the standard of performance by individuals and groups has been surprisingly good for the short time in which the musicians have been studying the instrument. It obviously makes a really big difference that they get given their own valiha to take home and practise with in their own time. In March 1998 the BBC World Service Outlook programme came to see the work of the children, interviewed them and recorded one of the end of term concerts. They were really impressed by the dedication of the children in spite of the situation they are in. There were 15 specially invited VIP guests and 50 children taking part. As usual, prizes were given to the best players including cassettes of the late legendary marovany player Rakotozafy (and by coincidence, in one of the villages we discovered a valiha maker, Rason, who produces small metal instruments much like a baby version of Rakotozafy's famous giant creation). 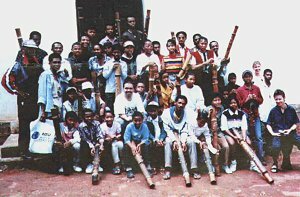 On our organiser's last report he said that during this party, with the BBC recording 50 children, it really brought home to him how Valiha High was succeeding in its aim to reinstate the value of the tradition and the instrument among young Malagasy people. Another surprise this August was that whereas we would usually expect to see a drop in pupils during the holiday season, this year we gained a whole party more from Antsirabe (4 hours to the south of Tana) who had come to the capital on holiday and were really keen to participate in Valiha High so no rest for the organiser and teacher! By the way, another welcome development in the footsteps of Valiha High is that a regular valiha school called Top Valiha has now started in a permanent location in Tana for pupils of all ages who can afford to pay. We hope that at a later date we will all be able to work together and perhaps organise some joint events to demonstrate the strength of this growing revival. Also, since there has been a small 'cafe boom' in Tana because of increasing tourism, there are now some jobs available for traditional musicians in these places. Of course, there is bound to be a little sad news. Because the valiha is such a fragile instrument, some of the earliest young pupils have found that they now really need replacements because they have played them so much, but they can't afford to buy and we can't afford to keep giving instruments to the same people. It's a problem which we haven't yet resolved, but it gives some heartache! I am pleased to tell you that Mr Randrianarivo is still the sole provider of our valiha. Thus, the instruments we give to all our pupils are of the best quality that our funds can buy, although the price has risen to 40,000 Malagasy Francs. This may only be £5 ($8), but in Madagascar it would feed a whole family for 4 days. Another increase in our expenses has been brought about by the fact that as we go to further villages, the transport costs naturally have risen. By the way, for anybody actually travelling to Madagascar, Valiha High would always welcome you to come and see our classes in action. If you'd like to do that, please let me know ahead of time so that I can put you in touch with our local organisers to locate where the scheme is operating at the time you are visiting. Please feel free to donate again, and spread the word to anybody else who you think might be interested in helping us. l appreciate that some people who would have liked to give more have been prevented from doing so because this is a private initiative and not a registered charity, and I would be very grateful for any advice and help that anybody can give on formalising our status. Quite simply, as many of you know, l have been touring almost nonstop with Tarika in the last 18 months which is why even this report has been so long in coming. Thanks to all the people who helped Valiha High to run in Madagascar - organisers, teachers, the generous donators of premises - and of course particular thanks to all those who continue to be our wonderful patrons, too many to mention individually though I would just like to particularly acknowledge the exceptional generosity of the Andrew Lees Trust, Azafady, The Sedgwick Trust, Lee Durrell of Jersey Wildlife Preservation Trust, Roger Armstrong of GlobeStyle Records, Robbie Ali and Folk Roots magazine. Various Artists - The Marovany of Madagascar (Silex). Hanitrarivo Rasoanaivo, c/o F.M.S., P0 Box 337, London N4 1TW, UK. Fax: (+44) (0)181-348 5626.